Students who play in a band know that there are four families of instruments that make up a typical orchestra. The families are: strings; woodwinds; percussion and brass. Each family has attributes that distinguish it apart from other members of the orchestra. For example, all woodwind instruments make noise when air is blown into the instrument and vibrates, thus creating the sound. The brass family sets itself apart from other families of instruments in that the instruments are actually made of brass. Early brass instruments were actually made of horn, shells, tusks or wood, but today the instruments are made entirely of brass. In addition to the materials used to make the instruments, members of the brass family are known for a variety of attributes: they are often associated with military music and military parades; and they can play louder than other members of the orchestra, making them a very powerful presence in an arrangement. In addition, brass instruments are often used in classic rock and in jazz compositions. Brass instruments create music when the musician buzzes his lips over the mouthpiece and blows. Valves on the instrument can be opened or closed with the fingers, changing the pitch and sound of the noise. In an orchestra, brass musicians often stand to perform. You can distinguish brass instruments apart from other orchestra instruments by physical features. Brass instruments are long pipes that widen at the bottom into a bell shape. The pipes are often curved to make them easier for the musician to hold or play. In an orchestra, the most commonly used members of the brass family are the tuba, the trombone, the trumpet and the French horn. A brass band is a musical ensemble made up entirely of brass instruments. The Trumpet: The trumpet is a popular instrument for school band musicians. The trumpet plays the highest notes in the brass family, and they are the smallest instruments in the family. The Tuba: The tuba is the largest of the brass instruments and plays the lowest notes. The Trombone: The trombone is probably best identified by its slide, which is used to change the pitch of the notes. It is considered a low brass instrument and reads notes on the bass clef. 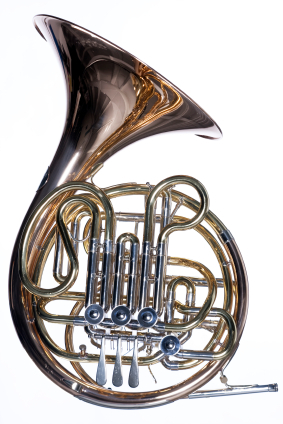 The French Horn: The French horn is a relatively large brass instrument, and can be identified by its circular twist and large bell shape. It has a lower pitch than the trumpet but is known as being a difficult instrument to learn how to play.